is the first step of purifying the mind." We have been spending much time this year helping children become mindful of their thoughts, emotions, and bodies. Through active engagement, reflection, and focus on the immediate moments of our time together, we hope that children realize that there is much potential for growth and learning when we engage truly with the present moment. In our room children have much choice and control over their activities. They choose what areas of the room they'd like to visit, what materials they'd like to use, and the direction and scope of their individual and collective play. Educators serve in role as attuned facilitators carefully observing, supporting and scaffolding children's experiences. A few times a week we ask children to participate in a whole group activity, usually focused on literacy. Our individual student clipboards are a versatile tool to use when we want to engage children in reflective writing/drawing outside of the classroom. 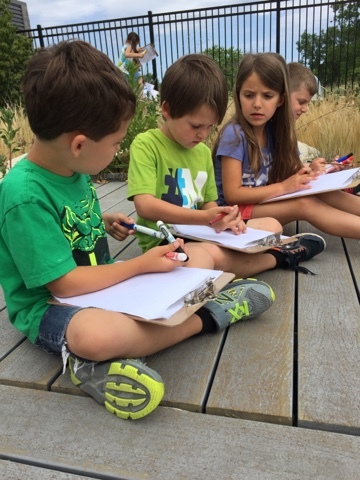 Today we encouraged children to choose a drawing tool they enjoy and headed up to the rooftop garden. There children were asked to carefully choose an area that captivated them and then quietly observe what they noticed for a few minutes. What did they wonder about the space? What did they think happened there before we arrived? After we left? Who lived there? We invited the children to sketch a drawing to show their interpretation and tell the story of their special garden spot. It was amazing to see the children's quiet, careful attention to their drawings. Many chose to use pencil and the details of their artwork told a rich story. 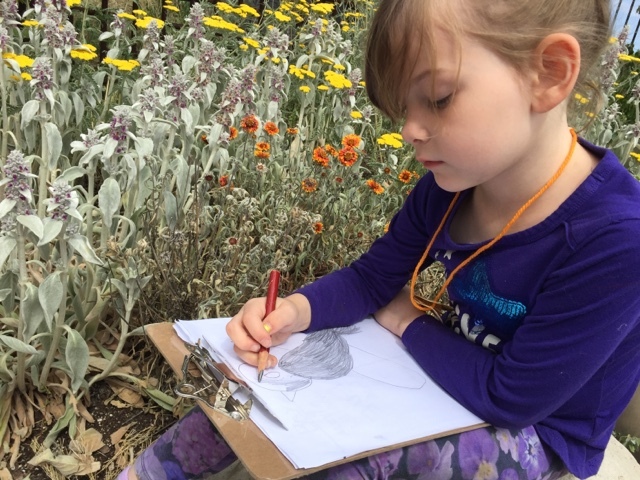 Some chose to work in solitude while a few others quietly whispered, sharing their drawings and pointing out other aspects of the garden to each other. They carefully noticed the details and highlighted what they liked about each other's drawings. We overheard very kind words and careful, constructive feedback as children offered suggestions to one another in order to help improve the drawing in some way. Many FDK teachers wonder about whole group activity time - is it appropriate and meaningful to ask all children to do the same thing and at the same time? 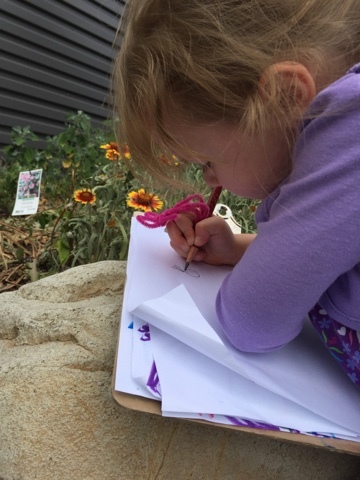 Is a program still emergent and child-centred if children are asked to participate in teacher suggested activities like drawing in the garden? We consider ourselves advocates for child-guided play and exploration but feel there is also a time and place for adult initiated activities such as this. 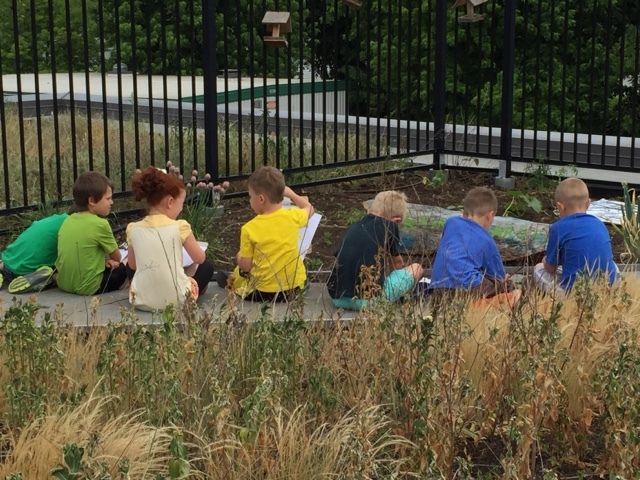 We have noticed that many children have been curious about the different plants growing in our school yard and predicted that they would find the ones growing upstairs just as interesting. We also know that many of the children spend much of their play time drawing so the activity would appeal to them. The actual act of drawing is very open ended and there are entry points for every child with this activity. The process is emphasized as being more important than the product and there isn't any wrong way of participating in the activity. For those few children who don't spend much time drawing this activity helps carve some time in our day where all children have opportunity and encouragement to do so. There are entry points for everyone. In a few days we will revisit our garden spots and compare our drawing with a new moment in time. 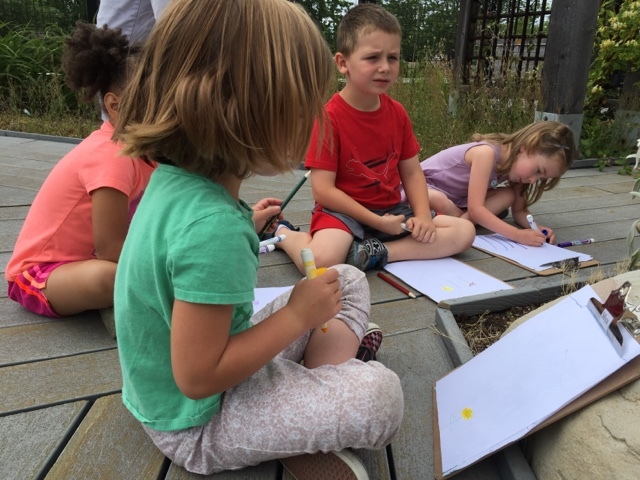 We wonder if the garden will have changed much since our last visit and how children will enhance their drawings in order to reflect this growth and change. We predict that like the vegetation, our children will also experience growth and development each time we revisit this type of experience together. 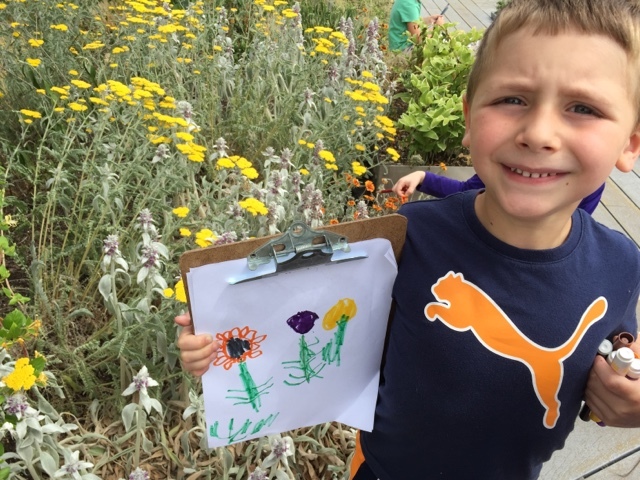 Perhaps next fall we will start this process even earlier in the year so that children can visit the same garden spot over and over again and witness the full cycle of life with the changing of each season!